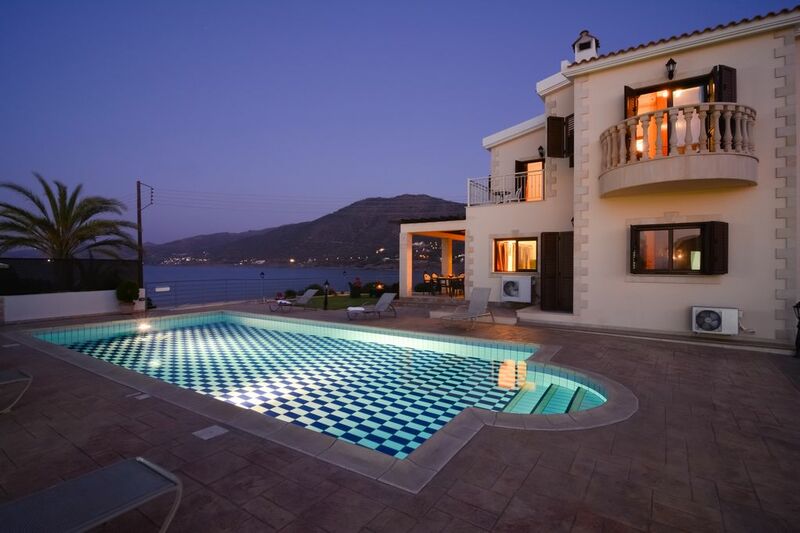 Brand new luxurious 4 bedroom villa sleeps 8. Private swimming pool and garden. Fully air conditioned. Panoramic view of the mountains and the sea with marvelous sunset. 20 metres to the beach. Restaurants nearby.The scenery combines the dramatic mountains overlooking the turquoise, warm and inviting Mediterranean Sea. The unpolluted beaches are a combination of sand and pebbles and the sea crystal clear. The small harbour of Pomos is the central point of the village which also offers a choice of restaurants ,coffee shops, supermarket .Staying in Kalli villa in the village of Pomos will be a holiday worth remembering and will leave you feeling refreshed and relaxed. The owners of Villa Kalli, Maro and Dino, welcome you to their villa and offer you their warm hospitality. Speaking both English and Greek, they will do their utmost to provide you with the best service without compromising your need for privacy. Having spent a number of years abroad, they fully understand the need and importance of their guests having a home away from home. Villa Kalli is without a doubt, a wonderfully designed property in a spectacular location, with stunning unobstructed views of the mountains and the sea and amazing year round sunsets destined to capture your heart forever. This newly built villa is made to high quality standards and is kept immaculate throughout, offering spacious and comfortable living both inside and outside. This villa will allow you to escape from the hectic city life, yet is an easy 20 minutes drive from the vibrant towns of Polis and Latchi and is approximately 1 hour north of Paphos. The village of Pomos itself is a picturesque fishing village located on the west coast, untouched the modernisation, the place is quiet and relaxed. The scenery combines the dramatic mountains overlooking the turquoise, warm and inviting Mediterranean Sea. The unpolluted beaches are a combination of sand and pebbles and the sea crystal clear. The small harbour of Pomos is the central point of the village which also offers a choice of restaurants, coffee shops, supermarkets and a bank for your convenience. Staying in Villa Kalli in the village of Pomos will be a holiday worth remembering and will leave you feeling refreshed and relaxed. En-suite to master bedroom. En-suite to bedroom 2 with shower. En-suite to bedroom 3 with shower. En-suite to bedroom 4 with shower. WC at entrance hall. As the villa is open plan it is very accessible in all the areas. The dining area has a table and chairs and the lounge area with stone fire place has a comfortable settee where you can watch tv or gaze through the doors at the amazing view. There is the main kitchen downstairs with all the main kitchen equipment eg cooker, hob, fridge, washing machine, dishwasher and microwave etc. Skiing is possible in the Troodos mountains during the winter usually in March. There are 3 golf clubs in the Paphos area with Tsada being the closest to the villa. Tsada golf courses is approximately 40 mins drive from the villa going towards Paphos. The other two are Aphrodite Hills and Secret Valley both situated nearer Paphos. The villa is only 20m, 1 minute walk from the beach. It has sand and fine stones. The water is very clear and clean. Also there is a fishing harbour 1 minute walk from the villa where fresh fish can be cooked especially for you. Kalli villa is approx 60 mins drive from Paphos International Airport. Hiring a car is essential. Polis is the nearest town and has all necessary facilities including many shops, cafes, bars and tavernas, pharmacies, hospital and banks. Pomos is a quiet village, the locals are very friendly and willing to help anyone that asks for it. It has 2 supermarkets, a bank, 2 coffee shops and 3 restaurants, and a small fishing port. Booking Notes: 25% deposit and the remaining amount in cash on arrival in Cyprus. Changeover Day: Time of arrival after 14.00pm - Time of departure until 11.00am Notes on prices: In addition to the rental cost will be an electricity charge for the use of the air conditioners during the rental period. The air conditioners are on an independent meter and the cost per kilowatt will be dependant on the kw price at that time.